Though perhaps not strictly needed for the "Challenge", I feel a little background and context may be in order! My first-ever railroad-under-construction is intended to fit in an L-shaped space around the top of the stairway up into our attic sitting-room. 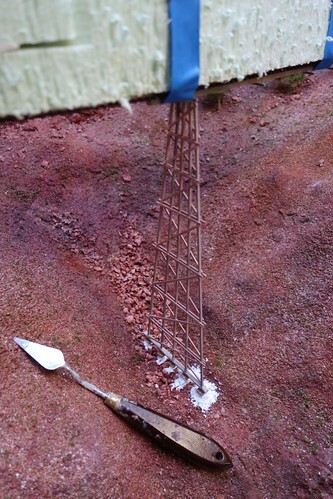 The layout will be some 10'6" by 5'3", on boards about 30" wide, in N-scale and set in the early steam period (1890s to 1915?) on an imaginary railroad which draws its "history" from the 1975 film "Breakheart Pass" (starring Charles Bronson), which used the Camas Prairie Railroad for its location-shots and dubbed its fictional version the "Wasatch & Nevada". Due to the nature of the site I have been working on completing as far as possible the short leg of the "L" out in the main room, prior to pushing the whole unit into place above the stairs. 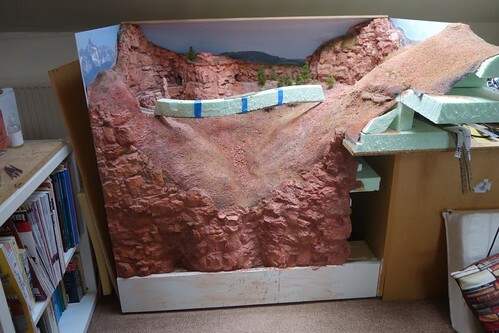 This section is effectively a diorama, designed around a trestle-bridge inspired by the CPRs "Half-moon Trestle". 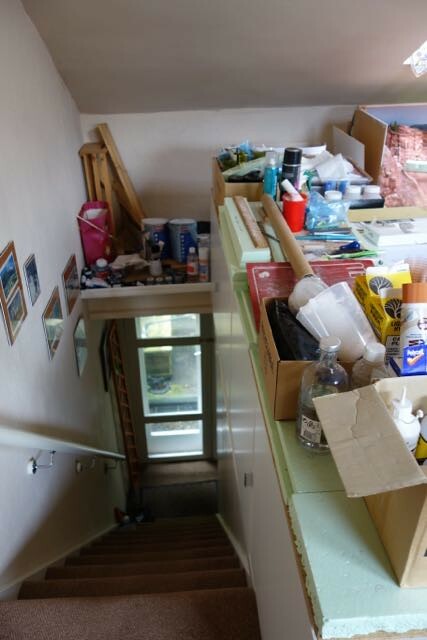 Above is the view down the staircase. The "storage-bench" to the right will be the long leg of the "L", and the area straight ahead with a jumble of paint-tins etc. will be the short leg. Just visible top right is the unit which will (I hope!) slide across to the left. Above an even closer view of the crucial area. Note the short length of trestle-base lying on top of the foam which is (so far) the only casualty in my process. 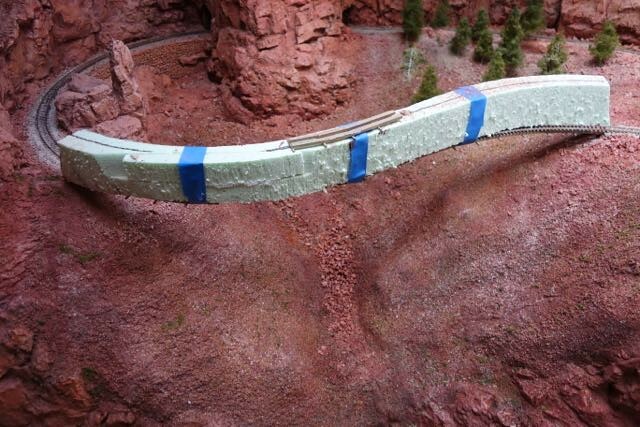 (The base was built and glued to the bottom of the track before the supporting foam was strapped in place.) The black line you can see along the top of the foam is just that, the marking for the track-centre as originally traced onto the foam base when it was whole (i.e. this is just one piece of foam, not two side-by-side). 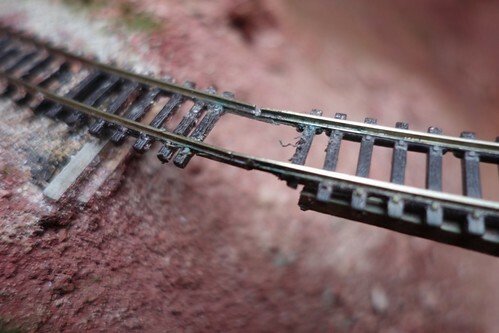 The foam-supported track has taken quite a few knocks in the landscaping process, so I'm grateful to have just the one casualty to glue back in place in due course. Last edited by jimbotten on Sun Dec 04, 2016 6:42 pm, edited 1 time in total. Just a brief note on the research and development that's already taken place before the starting-gun on December 1st. Apart from general reading up on trestles and how to model them I managed to locate two good overall views of the prototype from the internet, one looking in each direction along the Half-moon Trestle, and I've also been freeze-framing through the DVD of "Breakheart Pass" and making notes and sketches. 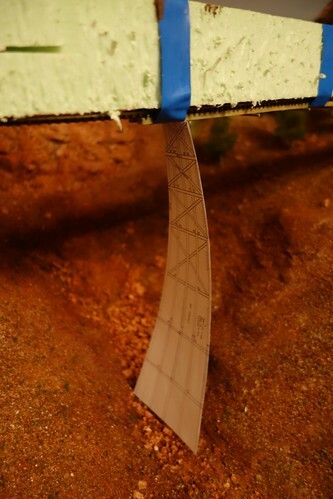 The internet images show that the two ends of the structure adopted different types of "footing". The "right-hand" end uses timber-walled caissons, while the "left hand" end uses more rough-hewn, cut-into-the-earth steps - probably due to differences in slope which are not mirrored on my model. This leaves me in a quandary as to whether I want to have the timber-lined caissons on both slopes, or... (Any advice or comments appreciated!) One certain difference between prototype and model is that the Half-moon is (as its name suggests) an arc, while the model has to take an S-shaped curve (the taking on of which may yet prove to be my downfall). It's almost two years now (!) 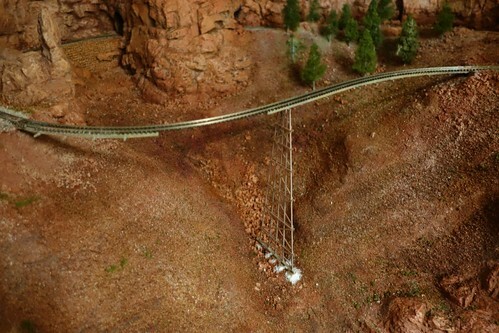 since I bought the JV Models kit for a Curved Trestle Bridge, and supplemented it with a lot more scale-timber of appropriate cross-sections from Northeastern Scale Lumber. 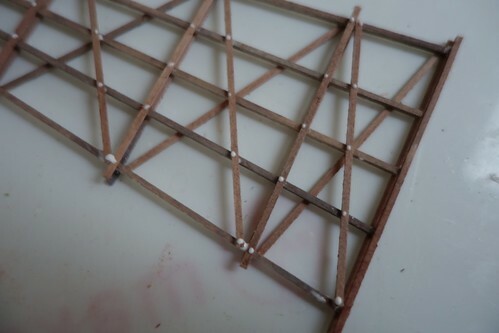 The freeze-frames from the DVD have given me more close-up views of the actual construction of the trestle and its footings, and shown that at some points I will need some round-section "log"-like timbers - which I have now sourced as lime dowel from Cornwall Boat Models. 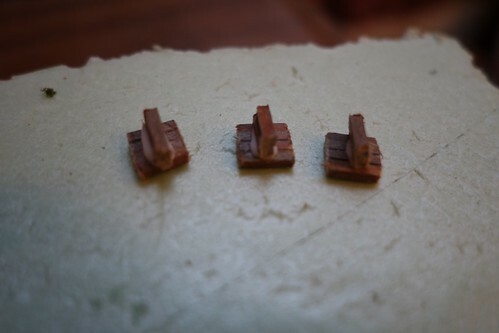 I have also laid in a supply of terracotta-coloured Jovi modelling clay in the hope that it will be of use in modelling the caissons/steps. 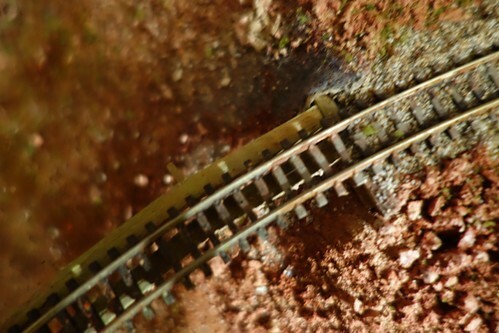 As seen above, some of the JV kit-parts have already been stained, in tandem with the long-ago building and installing of the timber road-bed under the track. 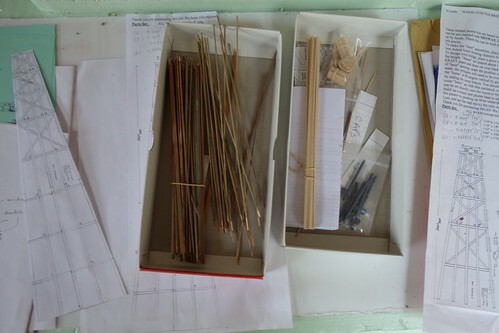 The template on the right is that included in the JV instructions, while on the left is an expanded version (photocopied and extended by hand with the aid of a ruler) to cope with the much greater maximum height of the intended model. Another copy of the expanded version has been mounted on board and provided with some glued-on guides of scrap-wood at crucial points (though it is yet to be tested...) So, onwards and upwards. Research or otherwise that's one large volume of timber in that there trestle - good luck and looking forward to the story of the build. Ah well, the model is nothing like the length-to-scale of the original (but still a lot of pokey little sticks to juggle, true). Fingers crossed. Using a stiff paper template I measured the needed height for the longest bent, gradually trimming from the bottom until I had the best vertical fit. 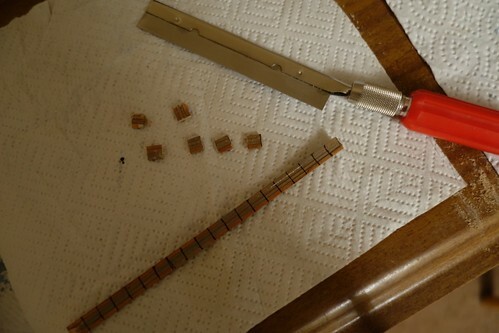 Once the glue had dried with the sashes all done for one side I (gingerly) freed the assembly from the jig, trimmed its length in accordance with the paper template, turned it over and fixed the sashes for the other side. 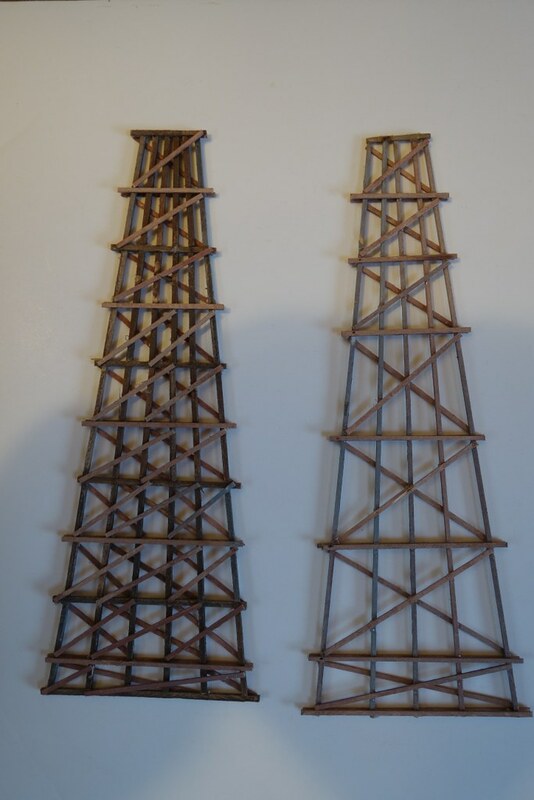 The various images (photos and freeze-frames) I have of the prototype from different periods show a variety of sashes in use at any one time; some solid through-beams and some pairs of parallel boards to either side of the posts. At least for this first, central, bent I opted for all side-boards, to maximise its strength (the posts thereby being continuous). However for the base-sash (or “sill”?) I filled-in the gap between the boards with wood-filler, to make it a solid through-beam. 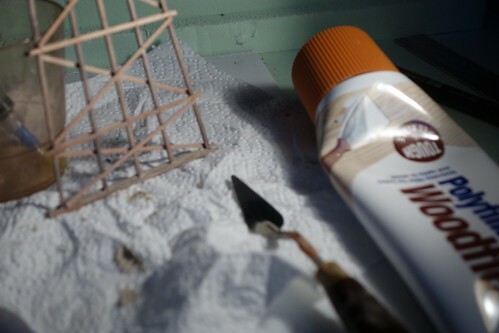 ...and finally glued in place, using wood-glue at the top to attach it to the already-in-place deck and No-Nails under the footing pads to attach it to the landscape and also achieve the correct height. So, as of this date we have the single largest bent installed, seemingly reasonably strong and looking the part (enough for me, anyway). Just twenty-odd more to go! With the central bent in place I decided to remove the foam support. Originally I’d thought to leave it in place a while longer, but that would just have made the installation of the other bents more awkward. To my pleased surprise the single bent seems to support the length of suspended track quite firmly! Removing the foam made it possible to repair the various bits of damage that the deck had sustained while the background landscape was being worked on. However, it also revealed the need for some other repairs. At the right-hand end the track and the deck had parted company horizontally (see photo below) presumably as the track’s curves have settled themselves over the year-plus it’s been in place. This was easily fixed by forcibly detaching the errant deck, adjusting it (with the aid of a craft-knife) and re-attaching it. More seriously, at the left-hand end the track itself was in trouble (see next photo). A lot of thinking and testing and some brave bodgery with a soldering-iron and files seem to have produced a track that gives a smooth run to my test-locomotive. As for staining the bents I found using shoe dye and rubbing alcohol worked very well to get the aged and weathered wood look. (Thanks, Peter, for the tips.) However, I have hit something of a hiatus. I was happily measuring and building the second-longest bent whilst carrying on a conversation at the EarlyN Yahoo Group, starting with an innocent enquiry aimed at the appropriate placing of refuge-platforms (with their fire-barrels) on such a structure. 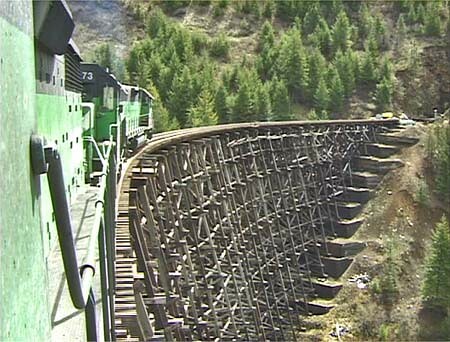 What unspooled was a lot of information about trestle-building in general which has left me in several quandaries. 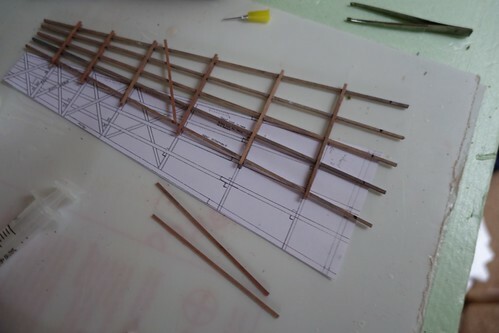 Through following the JV kit's template, and my own innocent nose, I've ended up with bent-spacings too close together and a bent structure that's too distinctly different from the prototype (which has fairly even "storeys" all the way down, while my model currently has shorter storeys at the top, directly beneath the deck). So I've paused at a point where I can still do some re-thinking (and perhaps re-modelling). Detail differences in the bridges occurred due to unusual circumstances in placement or geography. Changes also occurred when the bridges were repaired. Thus, over time, all of the bridges slowly changed. Huge appreciation from this beginner for the all the help that's been forthcoming here and via the EarlyN Yahoo Group. 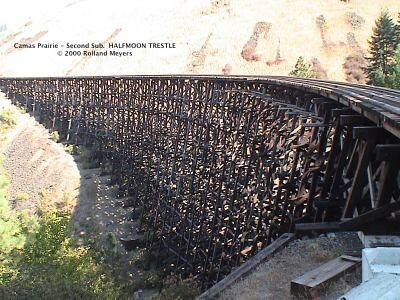 I have now located and downloaded "A Treatise on Wooden Trestle Bridges According to the Present Practice of American Railroads" (1897!) which tells more than anyone could possibly want to know about the design and construction of trestles way back when. It can be downloaded free from Forgotten Books so long as you’re prepared to put up with every few pages being obscured by adverts, or else you can get the whole uninterrupted thing by subscribing for a month (or more, if you get carried away). 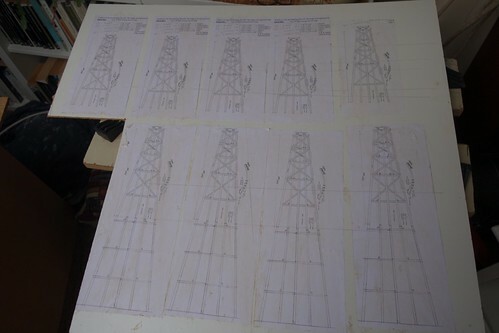 Lots for me to read and think about, but two things have immediately become clear - firstly my 16' spacing of bents is just about right (by some miracle), and secondly the scale 10 x 10 posts supplied by JV kits need beefing-up to 12 x 12s. Fortunately I'm not too far committed yet not to be able to go back and remake/rejig. Just need now to absolutely sure what I'm aiming for before I commit for a second time. All this may well mean I over-run the 3 month deadline for the Challenge, but as long as I get a finished model I won't mind! However, I have not only been thinking. I have been shopping! Taking recommendations from Peter Bowen’s “Challenge” postings I have ordered some isopropanol and a “wood-chopper” (though not the NWSL one). Instead I have gone for a Proses T-105, partly to avoid the complexities & costs of importation, but also because it seems to offer complete flexibility on angle cutting (rather than being restricted to 30, 45, 60 and 90 degrees). While I wait for it to arrive I am drawing-up a “parts list” for my trestle, so that I can (I hope) mass-produce all the same-size items and thus speed the construction process – in due course. So, watch this space, and keep your fingers crossed for me. These now came in useful as I reworked the design in accordance with Charles Sloane’s discoveries, using red ink. The (finally) successful (I hope!) 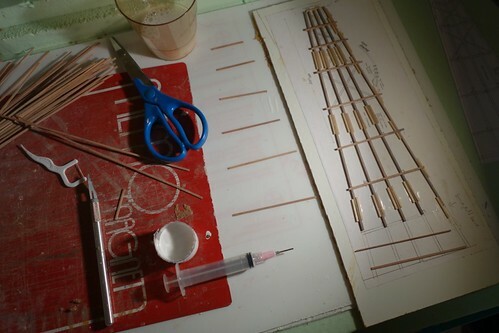 reworking (note even here some crossings-out) was then converted into a jig by gluing on guides. For these I used some of the now very surplus scale 10 x 10 timbers, which should leave the 12 x 12 components standing slightly proud, making it possible to glue on sways and sashes without getting them stuck to the guides (a learning-point from my original effort). To align the guides I tacked 12 x 12s in place using Bostik “Glu Dots” and worked up against them, trying not to get too much glue on the posts as I did so. 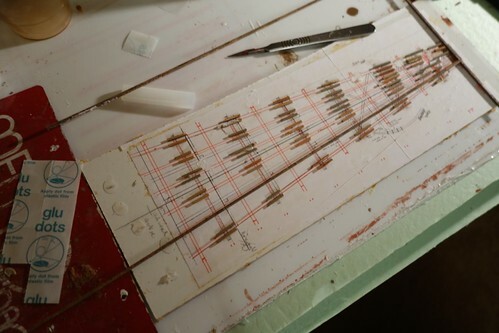 I have also now completed my initial parts-list, having worked out approximate numbers needed for each of the various lengths of sash, sway-brace and cill as they repeat from bent to bent, allowing for the fact that the number of 24’ storey units varies as the bents vary in height – so that more are needed of the shorter components. These (square-ended) components are I think unaffected by the changes from 5 to 6-post bents. 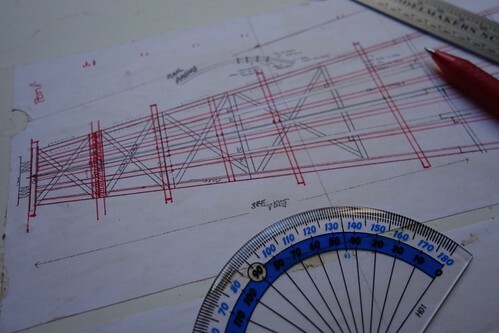 My plan is to determine the lengths of the individual more vertical (angle-ended) parts in the process of building the first bent in the new style, and then to mass-produce a suitable quantity (bearing in mind the variations created by the changes in height). I hope that’s clear enough - I think I know what I mean, but if any further explanation is needed, please ask! At least I see I’m not alone amongst the Challengers in having let time lapse since my last report. I have been doing some work on the trestle, though not as much as I ought, but there’s at least enough to be worth an up-date. So here goes... The first bent to use the “revised” design developed by Charles Sloane over at the EarlyN Yahoo Group (yes, I keep plugging it!) has been pieced together, inevitably taking much longer than the original over-simplified version, what with each full-length post (one piece in the original approach) now being made up of 5 or 6 separate segments with each end cemented to a through-cill. The result is on the left below, compared with the original on the right. To me it’s a huge difference! 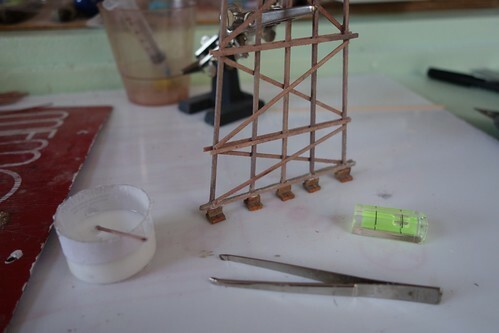 The end product was also surprisingly robust (I levered it out of the jig using a couple of artist’s palette-knives, with great trepidation). 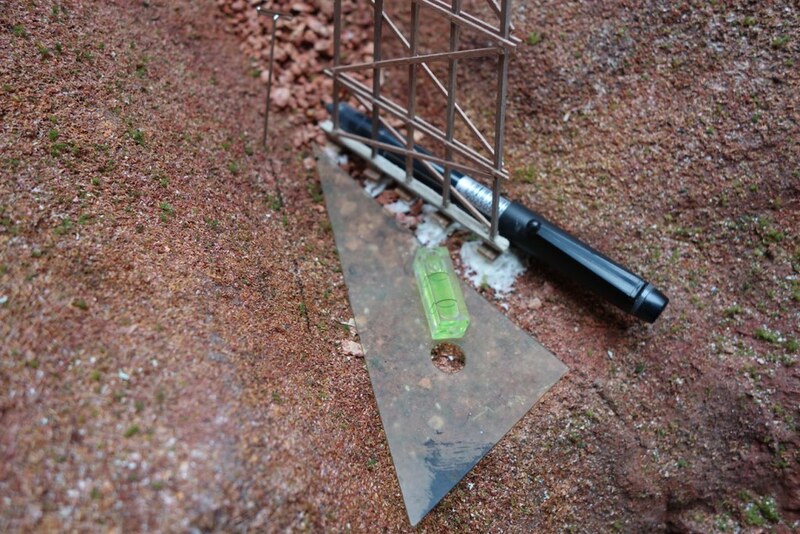 The next photo shows where a small set-square and a pen have been used to mark the level and extent of the base that will be needed to support the bent (which had been held square in place while the marking took place, calling for at least 3 hands). Three foam-nails were then driven into the area, with me hoping that they will help to provide a key to hold the modelling-clay in place. (Please remember that I am making this up as I go along and don’t really know if it will work at this stage.) 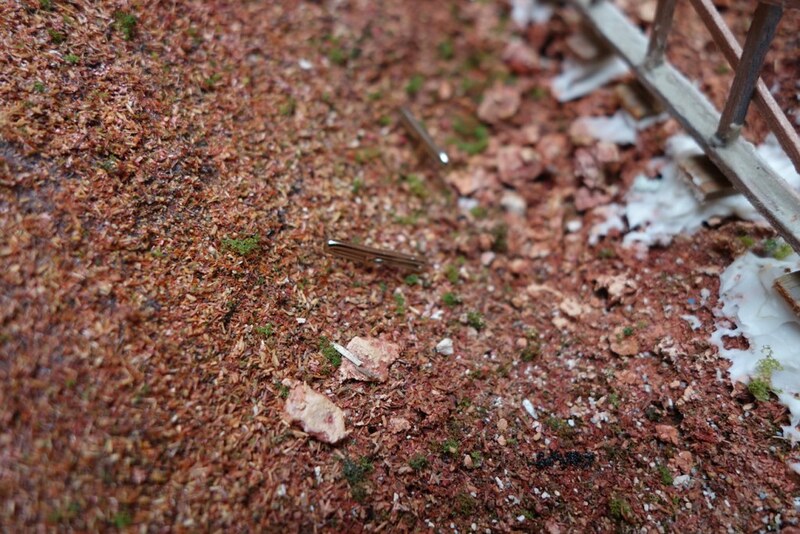 The photo below (if you look hard) shows the foam-nail heads (and the markings for the base-area).